I’m always a little wary of smart animal lists for two reasons. The first is that I know without a doubt that my greyhound, Chic, is the smartest dog in the world, yet greyhounds rarely rank in the top 10 on any expert’s list of intelligent dog breeds. I tell myself that’s just because greyhounds don’t find doing what humans want them to do particularly appealing. Which brings me to reason number two. It’s very hard for us humans to step outside the biases of our own species when placing judgment on a different one. What may seem like astute behavior to us may have no use or meaning within that other community. Even so, it’s fun to look at such lists to learn more about animal behavior and gain an appreciation for each species’ abilities and talents. While watching the video below, titled 25 Most Intelligent Animals on Earth, you might, like me, not be surprised to find bottlenose dolphins or crows listed here but astonished by the inclusion of sheep and squirrels. The list was compiled by Syed Balkhi and David Pegg, former college roommates at the University of Florida who enjoyed finding bizarre yet interesting information on the Internet and sharing it with their friends. Their joint passion led them to create List25, a collaborative project in which the two compile daily Top 25 lists of lesser-known but interesting information. After viewing the video, let us know if there’s a species you’d nominate for inclusion. As for me, I’d like the dog category broken down, with greyhounds positioned at the top of the list. If you’d like to see chimpanzees, whales, elephants, orangutans or sea lions in the wild (nos. 1, 5, 8, 20 and 21 on this list of intelligent animals, check out our African safaris, British Columbia trip, Borneo journey and Galapagos expeditions. I am just this year arriving at the point where I have great difficulty ingesting Ham. Chimpanzees being number one was maybe easier to guess than pigs at number two. Interesting top 25 though, pleased that dogs and parrots were high up with dolphins. Very enjoyable post Candice, thanks. BTW my border collies are smarter than your greyhound. 😉 lol..
As a matter of fact, John, that’s been an ongoing controversy in our family! 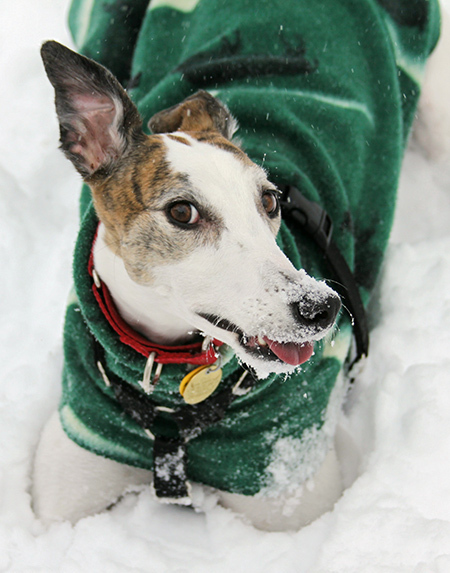 Some of us have border collies and some greyhounds — we each, of course, believe our own dogs are the smartest. Having had a small flock of sheep I was not surprised to see them on the list. The intelligence varied widely, but the most intelligent sheep (in my opinion) was the leader, showing that the others had the intelligence to recognize good leadership. They were especially good at memory. 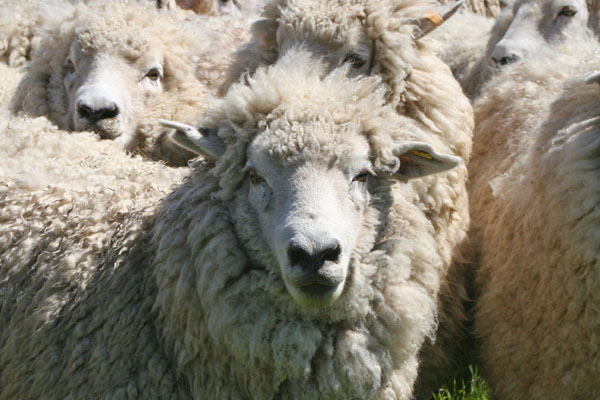 As an owner of sheep, I know they are not stupid and do have personalities. Seems a good list ….but they really must mean wild sheep…not the domestic/line bred /inbred/overbred domestics in the photo. Most domestic sheep display poor survival skills, display lemming-like suicidal behaviors and would probably make the bottom 25 list for this particular trait. Loved it. Glad to see raccoons on list. Hope their language is studied next to dolphins someday. Some of their sounds are incredibly similar. Spotted Hyenas have been shown to have an intelligence on a par with old world primates. You might also want to type in “talking starlings” on Google. I have seen some videos of starlings talking on the web that will likely amaze and amuse you. I agree with you Will, African Grey parrots should be at the top of the list especially for understanding abstract concepts and linguistic abilities. Based on a European Starling I had for over 13 years, Starlings should be a close second for those abilities. My starling, Arnie, learned to talk English, ask questions in English, use words and phrases he learned in new sentences and phrases he made up (all were in perfect English) and he even made up new words, similar to Alex, the African Grey Parrot. Arnie used the very abstract word “good” in the correct way for a variety of conditions. For example he said the meal worms I gave him were good. He said I was “good Judy” when I brought him his bath. He said he was a “good bird” when he did things I asked him to, etc. He also used pronouns in the proper way, depending on if he was talking to me or to other people. I never did figure out how a small starling could learn to talk English and understand it well enough to ask questions, like “What are you doing?” To which I once replied, “I am feeding some little birds.” (I am a wildlife rehabber, so do that a lot in summer). After thinking about what I had said for about a half minute, he replied in a piqued voice, “Arnie is a little bird.” To which I said, “Jealous much?” He didn’t reply to that remark. I was an elementary school teacher for 12 years. Arnie learned to use proper English much faster that many of my students. Interestingly, all of the mammals, birds, reptiles and amphibians I have cared for over my 45 years of rehabbing were very intelligent and learned new things very quickly. Owls did very intelligent things that ornithologists I reported them to would not believe. I see owls are included on the video and that is really great. African Grey. Scientifically proven (not surfed off the net). Thanks. I have to say, while pigs are said to be as smart as a three year old child, I’m guessing they’re a lot smarter than a lot of adults I’ve come across.